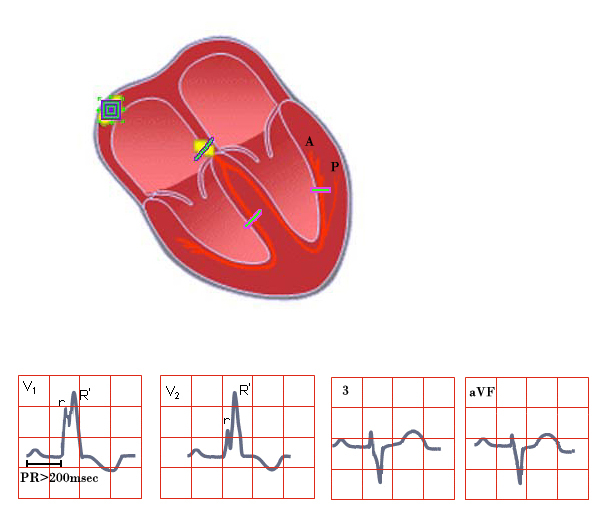 Trifasicular block is a combination of 3 different conduction abnormalities all found on one patient’s EKG. Typically the health care provider first finds the classic right bundle branch block (RBBB) pattern which is a QRS duration greater than 120 msec with an RR’ in lead V1. When the QRS axis is then identified, one notices that the patient does not have a right axis as would be expected with a RBBB, but rather has a left axis. This left axis is due to the concomitant left anterior hemiblock that manifests as a slurred Q or S wave in the inferior leads. Lastly, after the first 2 criteria are met, one notices that the patient has a first degree AV block (PR > 200 msec) in the last remaining left posterior fascicle. Trifasicular block should not be confused with third degree AV block which is total AV dissociation although trifasicular block can easily degenerate into third degree AV block if the remaining fascicle becomes injured.